Polishology: Mummy, May I Konad? The polish is a very dark purple/wine color, with loads of pink glitter. It is really pretty! I have noticed several comments on this being bumpy even after top coat, and I will admit, that after two coats of Seche Vite it was still just a tad bumpy. However, I personally did not find it to be distracting or annoying at all, since it is not that bad and the polish is definitely pretty enough to make up for it! 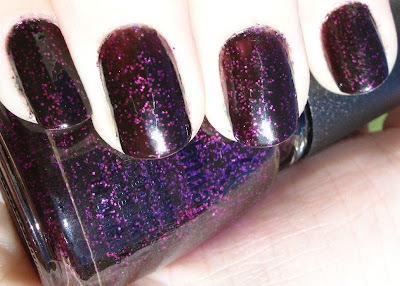 Overall a very fun, pretty, vampy color! 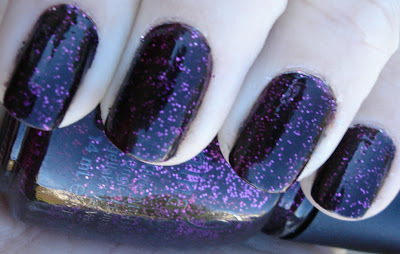 I am loving it as a Halloween polish as well as just a fall polish in general!